Energy saving ventilation fans run quietly and efficiently. There are a variety of ventilation fans for use, such as fans that shut off once the room has reached a lower level of humidity, and fans that also have lights attached to them. Proper ventilation is key to keeping a mold-free bathroom, but how often do people actually remember to turn on the exhaust fan? Perfect example is my 10 year old son who leaves the bathroom all foggy because he didn’t remember to turn on the fan switch. Apartment owners can probably experience this also, as their tenants frequently leave moldy bathrooms. The times they do remember to turn the fan switch on, they frequently leave it on and forget to turn it off. Either you don’t get the benefit of ventilation, or you waste money. A great way to solve this problem is a bath fan timer. 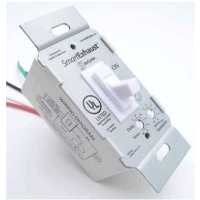 Bath fan timer switches are a replacement for the light and fan switches that allow for automatic timing of the length of time the exhaust fan runs. 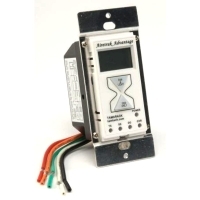 The AirCycler SmartExhaust Delay Timer Switch is a popular model that will turn the fan on automatically when the light is turned on. No more flipping two switches. A delay timer setting allows you to specify how long the fan will stay on after turning the light off, while a separate timer setting will make sure the fan operates a certain number of minutes each hour. It comes in both toggle and decora switch formats. As an example, suppose someone turns on the bathroom light for 5 minutes, with the hourly ventilation set to 20 minutes, and delay timer for 10 minutes. After the person leaves and flips the switch off, the fan will run for the additional 10-minutes delay time, totaling 15 minutes of operation for that hour. The microprocessor in the device will keep track of this and make sure the fan runs for another 5 minutes during that hour. If you don’t want to have the fan run after a quick visit to the bathroom, just quickly flip it on and off again after turning it off, and it will cancel the delayed start of the fan. So consider using an exhaust fan timer to make sure your bathroom gets the proper amount of ventilation without having to rely on people to turn the fan switch on and off. Not only will you have a better ventilated and dryer bathroom environment, you’ll also save some money by not leaving the fan on too long. The SmartExhaust bath fan timer introduces a simple, smart, flexible, and economic solution for exhaust ventilation requirements. It is designed as a replacement for the bathroom fan and light switch. By using a microprocessor to monitor and control fan operation, a precise amount of ventilation can be provided. 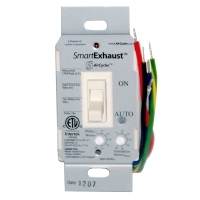 There are only two settings on the SmartExhaust switch – ventilation and delay. Ventilation is the minutes per hour that you want the fan to operate. Delay is the number of minutes you want the fan to run after the bathroom light has been turned off. The delay time provides additional run time of the fan to complete ventilating the bathroom after use. The SmartExhaust is so smart, you can tell it you don’t need the fan to run when you leave the bathroom. 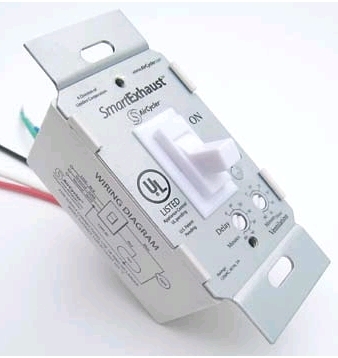 When you turn off the light, turn it back on then back off again within a few seconds it tells the SmartExhaust you don’t want the fan to continue running. 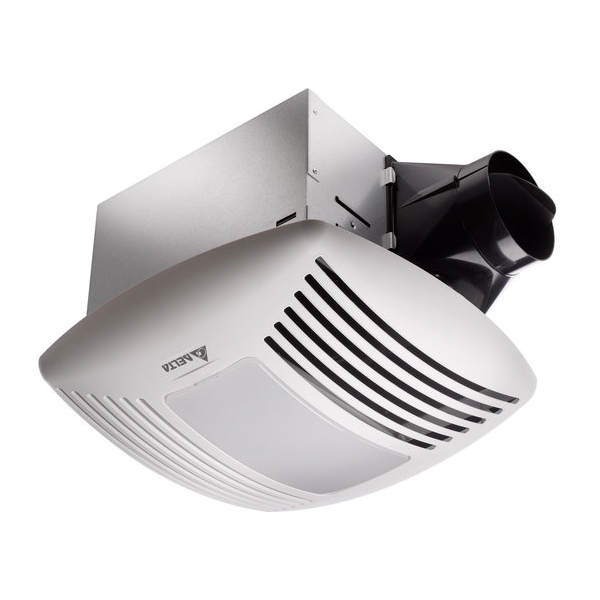 With SmartExhaust, you can earn LEED and ENERGY STAR points for enhanced exhaust ventilation and it makes standard bath fans ASHRE 62.2 compliant. The easiest way to save energy (and ultimately money) throughout the home is to regain control of the way the energy is being used. When you ventilate the bathroom, how often do you take into consideration the amount of time that should be spent ventilating, or how much energy is being wasted by over-ventilating? If you’re like most people, these two issues have probably never really crossed your mind. Using a bath fan timer allows you to attack both of these problems head on without giving it another thought. Experts suggest operating the bathroom fan for no less than 15, and no more than 20 minutes following a shower or bath. In this amount of time, the fan exhausts the moisture out of the room. Having the fan run for more time than this does allow the room to be ventilated, but it also wastes energy, leading to higher energy costs. Operating the exhaust fan for less time than this leads to condensation problems such as molding and rotting. These can inflame respiratory-related health issues including asthma. 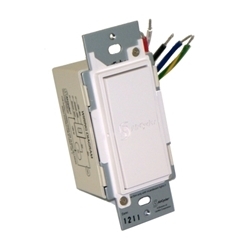 An exhaust fan timer replaces both the light and fan switches in the bathroom. It has two main settings (ventilation and delay), and the ability to cancel the delay. It uses a microprocessor to watch and control the amount of time the fan is in operation to provide a specific amount of ventilation to the room. Ventilation Setting – The ventilation setting is the amount of minutes each hour that you would like the fan to be in operation. Delay Setting – The delay setting is the amount of time you would like to operate the fan after the light has been turned off (this allows the fan to finish the ventilation cycle after the bathroom is no longer occupied). Cancel Delay – If you don’t want the fan to run after the light has been turned off, simply turn the light back on again within a few seconds. This will tell the timer not to operate the fan after the light has been turned back off. Once set, the microprocessor recognizes each of the settings and ventilates the bathroom accordingly by subtracting the delay time from the hourly ventilation time. For example, a person enters the bathroom for 5 minutes, with the hourly ventilation set to 20 minutes, and delay for 10 minutes. When unoccupied, the fan will run for the additional 10-minutes delay time, totaling 15 minutes of operation for that hour. The microprocessor will detect this and run the fan for an additional 5 minutes that hour. If the total time the fan has been run exceeds the 20 minutes that were initially set, the bathroom fan timer will subtract that amount from the 20, and that is how long it will operate in the next hour. Limiting the amount of energy that is used (in many cases wasted) through bathroom ventilation provides you with more control over both the indoor air quality of the home as well as the amount of energy being consumed. Whenever there is less energy being used in the home, less money spent on energy bills is sure to follow. If you have been paying any attention to the weather lately, you may have noticed that there have been record high temperatures in many areas of the country. This does not bode well for poorly ventilated attic spaces, and the living areas below them. Without knowing how to cool attic spaces, outside air comes into the living area of the home, causing higher energy bills. The best way to cool attic spaces is to install solar attic fans. Not only do they efficiently cool the attic, they do so without costing a penny to operate. 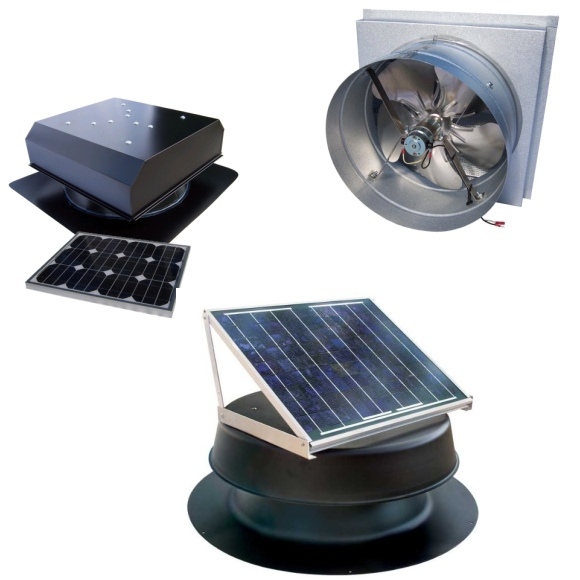 Solar powered attic fans use active draft ventilation as opposed to passive draft ventilation used by attic fans that consume residential energy. What this means is that solar fans push hot air through the attic and out the vent, lowering the attic temperature. In contrast, passive draft ventilation pushes hot air through the vents, which creates a draft, but does not actually lower the attic temperature. When completely under the exposure of the sun, a solar fan moves 850 to 1550 cubic feet per minute. A fan knows just how to cool attic spaces based on the amount of wattage it has. A higher wattage fan will move more air than a lower wattage fan. The wattage necessary for your attic largely depends on the size of it. To determine the proper amount of attic ventilation you can use an attic fan calculator. Installing a solar attic fan is also the best way to cool attic spaces because of the savings that will be acquired. A solar fan operates using only the power provided by the sun, completely eliminating the cost of attic ventilation from energy bills. When you think of conservation in the bathroom, water is probably the first thing that comes to mind, right? However, a considerable amount of energy is used here also. Aside from lighting and water heating, energy is used quite frequently through the bath exhaust fan, especially since it is often left running even when the bathroom is unoccupied. Installing an energy efficient bath exhaust fan reduces energy use in the bathroom while helping to maintain a healthy home. Proper ventilation can reduce moisture build-up, condensation, and molding without raising the energy bill. The typical exhaust fan achieves this while using a considerable amount of wattage for operation and up to 100 watts for lighting (if included). 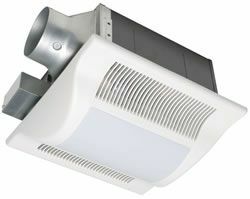 An energy-efficient bath exhaust fan operates using from 7-watts to 19-watts of power, lasts 70,000 hours (about 8 years nonstop), and if included, uses a light that consumes no more than 26 watts of power. Exhaust fans are often left running too long for fear of the problems caused by excess heat and humidity, as well as simply being left and forgotten. An energy efficient fan with a humidity sensor detects the level humidity and shuts the fan on and off once the bathroom is below the 40% humidity level. This maintains proper indoor air quality, while ensuring the fan is not left running for too long, or not long enough. In addition, an energy saving bath exhaust fan operates quietly. In a nutshell, these fans save both energy and money, increase home efficiency, and decrease the amount of noise in the home. How long do you keep the bathroom fan on after taking a shower? If it is on for less than 20 minutes, mold can build up over time, aggravating respiratory problems such as asthma, and creating a displeasing odor. Consider how many times you leave the fan on for more than 20 minutes. While it is important to properly ventilate this area, it is also important to save energy wherever possible. 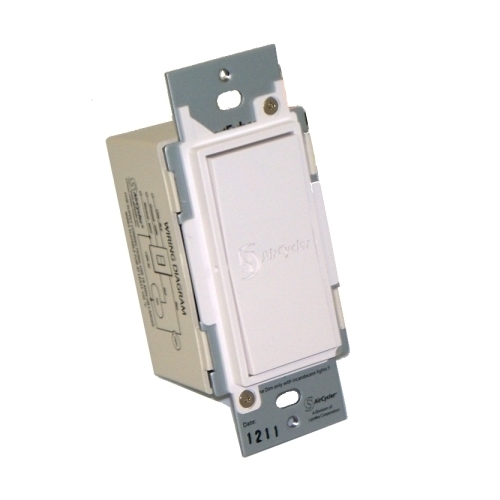 Whether you require a bath fan timer in a home, school, office, or hotel, the fan light switch allows you to do both. 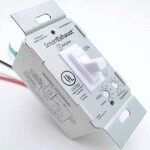 Installing a light and fan switch for the bathroom is as simple as connecting the bathroom light and the exhaust fan to the switch. Most timers include settings that when flipped on, the switch activates the light and exhaust fan. When flipped to the timed position (sometimes referred to as delay), the light will cut off while the fan remains on. Most light fan switches can be adjusted to run the fan for as long as 60 minutes. Not all bathroom fan timers are made the same. For example, the Intermatic light fan switch is completely manual, similar to a kitchen timer, while the AirCycler light fan switch is digital, offering ventilation and delay settings. With digital timers, flipping the timer to the off position will cut off both the fan and the light. However different they may be, a fan light switch is manufactured for use in a variety of applications, such as with lights, exhaust fans, and heat lamps. Operating the bathroom exhaust fan allows the room to be clear of moisture, which can cause problems over time. The problem many people run into is that the fan does not run long enough, it runs too long, or the exhaust fan switch is connected to the light switch, cutting both off or keeping both on. A fan light switch which connects to the light switch allows you to properly ventilate the bathroom without wasting energy. Continuous, central ventilation system, such as the Panasonic 2-Speed WhisperCeiling Exhaust Fan FV-11VQD2, are used to to continuously replace stale air with fresh, clean air in the whole house quietly and energy-efficiently. In the summer, in fact, circulating air can keep your house feeling 4 degrees cooler. Intermittent ventilation fans, such as the Panasonic WhisperFit-Lite Exhaust Fan, are used in certain areas like the bathroom, kitchen, or garage to quickly exhaust moisture and chemicals. In fact, if you live in an â€œairtightâ€ home, the Panasonic â€œbathroomâ€ (intermittent) fans are quiet and energy efficient-enough to continuously ventilate your entire home.